Worsening pollution and a spate of health problems are prompting a spirited citizens’ fight against one of Turkey’s largest coal-burning power plants, which has been spewing pollutants into the air over popular tourist resorts along the Aegean coast for more than two decades. “All my family members and I generally feel very low, and sometimes we can’t even breathe properly when the air pollution level increases,” says Dr. Bahdiye Gurkan, who lives in the village of Yatagan. The power plant is situated on its outskirts. When construction began on the coal-fired plant in 1976, only 4,000 residents lived in Yatagan. Today, 20,000 people live around the 630-megawatt plant, which is considered outdated and inefficient by modern standards—and poses a major threat to everyone’s health. Gurkan and another resident sued the operators, the state-owned Turkish Electricity Co., for health problems caused by the plant. On June 21, the local court ordered the operators to pay a fine to the pair in a landmark decision. The victory, Gurkan says, sends a message that residents have an ally in the courts. That may be so, but the courts seem powerless to enforce their decisions. Turkish courts have ordered the coal-burning station shut many times, but the rulings have been ignored. Last year, the local court in Aydin, about 50 miles from Yatagan, ruled that the power station must cease operation because it did not have official permission to run. Turkey has 14 such power stations operating without official permission. The Turkish Council of Ministers has allowed the Yatagan station to continue operating because of an energy shortage. It has even formalized the arrangement through a decree to keep the plant open. This has fired up environmentalists, local officials, and residents. “The Council of Ministers has been ignoring the court verdict, and in this way they have damaged both human health and the environment,” says lawyer Ahmet Okyay, a member of the Izmir Bar Association’s Environmental Movement. Yatagan municipal Mayor Hasmet Isik says the number of people suffering from lung problems and cancer has increased dramatically—although his charge is not reflected in official government reports. More than 10 people have died of lung cancer in the past two years, he says. “The true number of people in the area who have lost their lives because of lung cancer is not reflected in the reports,” Isik claims. “The doctors in the official hospital change the cause of death on the death certificate, giving it as a heart attack or some other reason.” Isik says the power station has also damaged 1,200 acres of fruit-growing land, destroyed olive cultivation, and decimated honey production. He blames acid rain caused by the pollution. Efforts to reduce the pollution have failed. A chimney gas refinery system, installed on Jan. 18 to curb emissions, exploded two days later and has not worked properly since. In June, two of the station’s three units were temporarily shut down three times by authorities after spewing out dangerously high levels of sulfur dioxide into the air. 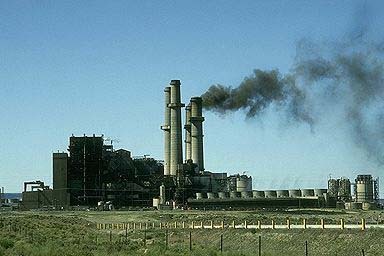 The same thing happened on July 1, and the station was closed for a day—bringing to 51 the number of times the plant has been forced to shut down because of pollution since the beginning of 2000. In the latest incident, the district administration warned people not to venture outside their homes unless absolutely necessary until the pollution cleared. A heavy temperature inversion caused the level of sulfur dioxide to increase almost 25 times beyond its safety limit, most notably in the nearby Yenikoy and Sahinler villages. The area was saved only when a strong wind dispersed the pollutants.